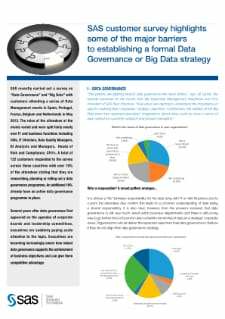 View the results from this SAS customer survey on “Data Governance” and “Big Data”.The roles of participants vary and were split fairly evenly over IT and business functions including CIOs, IT Directors, Data Quality Managers, BI Analysts and Managers, Heads of Risk and Compliance, CFO’s. A total of 122 customers responded to the survey with over 70% stating that they are researching, planning or rolling out a data governance programme. An additional 18% already have an active data governance programme in place.